For the photographer Thomas Demand, Germany is like any other country because it is haunted by history. Just as the act of using a computer comes with an implicit advisement–RTM (read the manual) or, less politely, RTFM–so any serious engagement with contemporary art comes with a like directive: RTC (read the catalog). For many, I know, that practice is more honored in the breach than the observance. Rumor to the contrary, art catalogs are in general clearer and better written than computer manuals, even if they are probably a lot less cogent than they should be. Boris Groys has argued that the fact that no one reads most art commentary, as he calls it, should be taken as one of its great attractions for the writer: “For this very reason one can, in principle, write whatever one wants.” I hope it’s not quite true that no one reads it, for today one can’t simply be a viewer, as we habitually call the addressee of contemporary art. To see a work without a sense of the commentary around it–its linguistic framing–means blinding oneself to where its edges are, to where the work leaves off and reality begins–to the work’s position in the world. All of which amounts to a circuitous admission that my first view of Thomas Demand’s exhibition at the Neue Nationalgalerie in Berlin (on view through January 17) was constrained by my neglect of an important part of its verbal framing–and this despite the fact that there have been few exhibitions of photographs in which writing is so prominently featured, though never in the photographs themselves. And believe me, I did read the texts so prominently and atypically displayed in the gallery–about which more later. They also constitute an important part of the catalog, so this was one instance in which I really did RTC right there in the gallery as I went along, and as one is meant to do. No, what I forgot to do (the purloined-letter syndrome at work, perhaps) was to RTT. If I had bothered to read the title, I might have been saved the puzzlement I experienced when I wandered downstairs looking for the men’s room and passed a bulletin board festooned with local press clippings about the exhibition. Stopping for a quick look, I was bemused by the slant the German papers had given their coverage: it seemed they all saw the show as the artist’s meditation on his and their homeland. “Demands Deutschstunde,” read the headline in Die Welt. Likewise Die Zeit headed its report “Modell Deutschland” and Der Tagesspiegel, “Deutschland, deine Bühnenbilder” (“Bühnenbilder” means stage scenery, but here it is a play on words: “Bilder” are pictures, images, and Demand’s photographs are indeed staged images, albeit without actors). Other publications saved mentioning Germany for the subhead, where it could be conveyed in more than two or three words: “Thomas Demand blickt auf Deutschland” (Berliner Morgenpost); “Die Neue Nationalgalerie Berlin präsentiert Thomas Demands Deutschlandbilder” (Berliner Zeitung). Only as I scanned these articles with my weak German did I cotton on to the fact that Demand’s exhibition had a title, cunningly disguised as its location: “Nationalgalerie.” This was, I should have understood, Demand’s exhibition about or, better yet, of his country. Demand is sometimes mistaken for a member of the “Becher school,” whose best-known members are Andreas Gursky, Candida Höfer, Thomas Ruff and Thomas Struth, a group of older German photographers who studied under Bernd and Hilla Becher at the Düsseldorf Art Academy. Demand, who was born in Munich in 1964, left Düsseldorf (where, studying sculpture, he did not work with the Bechers) in 1992, and in the years since he finished his MA at London’s Goldsmiths’ College in 1994 he has become one of the world’s leading photographers. 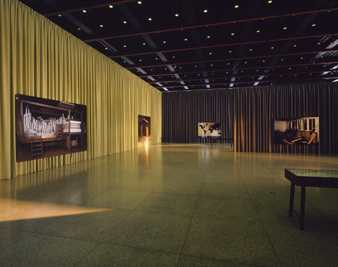 The Neue Nationalgalerie exhibition follows big shows of his work in London (Serpentine Gallery, 2006) and New York City (Museum of Modern Art, 2005), among others. The monumentally scaled images of the Becher school are typically hyperbolically detailed–their macroscopic dimensions proffering a plethora of microscopic particulars, whether of faces, streetscapes, library interiors or factories. While it has often been noted that the massive size of Becher-school photographs gives them something like the impact of a painting–whereas traditional photographic prints were indeed prints, demanding the kind of intimate engagement suitable to an etching–large-scale Modernist painting, from Matisse to Barnett Newman to Alex Katz, had always favored the elimination of detail. The Becherians, by contrast, multiply details ad infinitum. And though none of them should be taken for mere technicians, the fact remains that in looking at their work one can never be unaware of the technical achievement involved in lending the camera a sort of superhuman eyesight. Their work is often referred to as cold and objective. No wonder, when it seems to lend the human eye the powers of a microscope, even when scanning a distant horizon. Demand’s photographs are nothing like that, despite their equally grand scale. And one would not call him a brilliant photographic technician, which is perhaps not surprising since he came to photography through sculpture. You don’t look at his pictures to marvel at his subtle handling of light, incredible control of focus and mastery of tone. In fact, he seems deliberately to cultivate the sense that things are ever so slightly overlit, that just a little bit less of the scene is in perfect focus than might have been possible, that the image could have been rendered with greater crispness and definition. Not that he cultivates the look of the amateur snapshot: nothing seems accidental or haphazard here. But rather than availing himself of the camera’s potential for an inhumanly penetrating apprehension of surfaces, he evokes what one might call a normal, technically competent but unfetishized mode of looking. The photographs pretend to be a little less carefully made than they really are. While the manner of looking appears to be normal, the same cannot be said of what Demand gives us to look at. He shows ordinary things but not real ones. As is well-known by now, all of his photographs are taken in his studio; employing existing photographs, usually from the media but sometimes his own, as his sources, Demand uses paper, cardboard, cellophane and other flimsy, everyday materials to construct full-scale replicas of actually or formerly existing places. (At least they’re said to be full-scale, although there are a few cases where this is obviously impossible: Fabrik [Factory], from 1994, for example.) These empty stage sets are what we see in the photographs. The reconstructions follow the general lineaments of their originals, but with most detail eliminated. In particular, every trace of language has completely vanished: the papers strewn across the work table and floor in Büro (Office), from 1995, have no text on them; the labels next to the doorbells that are the subject of Hinterhaus (2005) are variously colored but bear no names. (Even the work’s title bears no translation; one dictionary explains that it refers to “part of a tenement house accessible only through a courtyard and thus considered inferior.”) In general, since everything in the photographs has been newly built, nothing shows any signs of wear, any smudges or defects. Each thing has become a sort of abstraction of itself. In this, Demand shows more affinity with the tradition of grand-scale Modernist painting than with other recent German photography. And yet a few important details are visible in Demand’s images–details not of the things depicted but of how they’ve been reconstructed. This is the real reason the pictures must exist at this scale–if they were the size of classic photographs, it wouldn’t be clear enough that they show a world made of paper. Demand has made a small number of more modestly scaled works, mostly still lifes, and they are among his best, but the things in them are shown at the same size they would be in any of his other photographs. Always, things appear as makeshift replicas. These images construct illusions only to deflate them. The image is empty, and eerily disinfected, and Demand makes sure you know it. You see the seams in every wall, the folding of the corners of the furniture. These are two-dimensional pictures of three-dimensional pictures based on other two-dimensional pictures of the real world. And how real is that, anyway? I suddenly feel like I’ve lost track. An ambivalent relation to the reality that much photography earnestly aims to record is central to Demand’s work. The titles, like the ones I’ve already mentioned, are clipped, tight-lipped; divulging minimal information, they underline the work’s tendency to abstract itself from and generalize the source image, to present an almost Platonic idea of, say, a kitchen (Klause 3 [Tavern 3], from 2006); an Olympic diving board (Sprungturm [Diving Board], 1994); an architectural office (Zeichensaal [Drafting Room], 1996); or whatever. Nevertheless–and here’s where the injunction to RTC comes back to haunt us–Demand has always let it be known that his images represent particular places, and while some of these places may be of merely personal interest, others are historically fraught. Consider Raum (Room), from 1994: it depicts a white-walled, low-ceilinged place with blackened windows–but entirely wrecked, the Platonic idea of a shambles. For anyone familiar with the history of photography in recent art, it is impossible not to see Raum as something of an hommage (but perhaps also a retort) to one of the touchstone works of the new large-scale photography typified by the Becher school, Jeff Wall’s The Destroyed Room (1978), the first of the Canadian artist’s “cinematographic” (his term) lightbox transparencies. is based on a picture of the bombed-out remains of Adolf Hitler’s headquarters following the failed assassination attempt of July 1944. As much as the picture shows a key event in German history, so too it has been associated with the history of the cultural reception of Nazism in post-war Germany: it was published in many school books in the 1970s as it illustrated (with undue emphasis) that some resistance to Nazism had existed during the war. Any visible sign that this place has anything to do with the war, with Germany, with Hitler, has been systematically removed. You won’t find any telltale swastikas half hidden amid the debris, no matter how hard you look. Nothing indicates a temporal location in the 1940s. Walter Benjamin famously observed that Eugène Atget photographed Paris as if it were the scene of a crime; Demand meticulously scrubs away all evidential significance from the scenes he depicts. He utterly defeats the forensic gaze. But that doesn’t necessarily mean that no crime has been committed or that it can’t be solved; just that one can never know simply by looking, no matter how hard. Godfrey informs us that Spüle (Sink), from 1997, is based on the basin full of unwashed dishes in a friend’s house. Of course, they are the cleanest, shiniest unwashed dishes you’ve ever seen. This piece is one of the rare exceptions to the generally bland–uncannily, hauntingly bland–affect of Demand’s work, maybe because of the acute high angle from which it was taken. Who stares down at a sink full of dishes like that? Myself, I try not to look at them too hard even while I’m washing them. Gawking into the sink’s mirrored depths–that is, its mirrored surfaces–one might well be looking for the absent clue to a crime. Terrible things can happen in our friends’ houses too. The ambivalence toward writing that characterizes Demand’s photography–ostentatiously driven out of the image itself, language hovers portentously around it–is a product of the delicate balance he is trying to strike between the viewer’s position of knowledge and ignorance of the source of his motifs. For the most part he succeeds. It’s not really important that the viewer know in any particular case where the image comes from; but it is important that in the back of one’s mind there lurks the possibility that the image might refer to something of historical significance. The secondary status of this knowledge is signaled by the fact that Godfrey’s explanatory essay, instead of introducing the catalog as it usually would, is placed at the back of the book, after the images, and is numbered separately as well, and printed on different paper, like an insert. Of course, there’s something artificial about putting the text in quarantine this way, but it makes the point. That’s not to say the catalog entirely downplays writing. Demand has added a sort of intermediate layer of text between his one- or two-word titles and the art historian’s essay: each photograph is now accompanied by “captions” contributed by the prominent playwright and novelist Botho Strauss. The captions modulate fluently between narrative and essayistic registers without ever directly addressing the pictures they accompany; Hitler is mentioned in the caption for Raum, but since Strauss does not convey the backstory or mention the image’s source, the unprepared (non-German) viewer will be none the wiser. As well as appearing in the catalog, which is designed so that the reader encounters the caption before the image, these texts are presented in the Neue Nationalgalerie on a nearly equal footing with the images, printed in oversized books laid open to the appropriate page in heavy wood-framed vitrines next to each photograph–all enveloped in a simultaneously understated and theatrical exhibition design by the British architectural firm Caruso St John. Some three miles’ worth of gray curtain material has been used to shadow and subdue the Neue Nationalgalerie’s classic Mies van der Rohe architecture while nesting the cool artifice of the photographs within a second layer of artifice. The museum itself could almost be the set for a Demand photograph. On my second take of the exhibition, after sighting the telltale bulletin board, what struck me was how not-wrong I’d nevertheless been in failing to notice the Germanness of Demand’s Germany the first time through. Eliminating all that detail from his imagery, and especially eliminating writing, effects a sort of displacement or dislocation; it takes things out of their places, transferring them to a purely mental realm. Still, the tacit nature of this work’s Germanness is striking. Imagine walking through an exhibition by Joseph Beuys devoted to the idea of the German nation without having to notice that this is the theme. Impossible. For Gerhard Richter, even more impossible. With Sigmar Polke, Hanne Darboven, Anselm Kiefer, Isa Genzken or Martin Kippenberger–for any of the photographers of the Becher school, too–a reflection on Germany and the traces of its history in the present could only be patent, unavoidable. Is this Demand’s lesson: that Germany is now no different from anyplace else, that it is at last a normal, self-confident European nation like any other, unburdened of the memory of its historic tragedies, free of the guilt and resentment that have weighed so heavily on Demand’s precursors? Has the effort of Vergangenheitsbewältigung (coming to terms with the past), a process as cumbersome as the word, been completed, or has it simply fizzled out? But what counts as destruction, and what counts as “ours,” depends on your viewpoint. In 2002 the German Parliament voted to demolish the Palast der Republik, the grandiose seat of the former East German Parliament (which was, amazingly enough for those of us who are accustomed to official buildings being off-limits to the public except under the tightest security controls, a kind of municipal leisure center). It had been closed since 1990, and the idea was to replace it with a replica of the kaiser’s castle that had once occupied the spot. The German Parliament sought to efface part of Berlin’s living history in favor of sham historicism. Nothing that belonged to the GDR, according to powerful elements in Germany today, could possibly be “ours.” In the meantime, a provisional building sits on the site, Temporäre Kunsthalle Berlin, with a two-year mission to showcase contemporary art–inside and out, for the building’s facade as well as its interior is being given over to artists’ use. Ah, Germany! Where else would it seem reasonable to use some of the country’s most ideologically contested terrain as an artistic proving ground? At present, Bettina Pousttchi, a Berlin-based photographer and sculptor, has turned the building into a three-dimensional billboard, covering all four sides (through February) with a sort of digitally processed abstraction of the facade of the Palast der Republik, which she has titled Echo. It’s as though the ghost of the old edifice has returned to haunt its former site, strangely transformed but still recognizable–and with the image of a clock substituted for the coat of arms of the GDR. Usually, when we say a photograph is of something, that little word “of” means that some light from the object was reflected through the camera’s lens to leave its traces–that there is an indexical relation between the thing and the photograph. Demand’s Raum is not “of” Hitler’s headquarters in that sense, nor is Spüle “of” his friend’s sink. What his work asks, among other things, is whether and how photographs can be about things that they are not of. Is Demand’s work a reflection on the things that his source photographs are of–on Germany, let’s say–or is it an effacement of those things, a way to “erase the traces,” as Brecht once put it? To choose either position seems equally facile. Pousttchi’s Echo, on the other hand, really does derive in part from photographs of the Palast der Republik. But the photographs have been so heavily manipulated that initial indexical relation has been reduced to a merely homeopathic quantum. The relation of “of-ness” has nearly disappeared. It’s the beholder who puts it back. Like Demand, Pousttchi is concerned with history and memory–or its loss. Echo has a representational specificity that Demand usually eschews or effaces, to be sure, and rather than generalizing her source material by eliminating details, she has introduced a new element of visual noise into the image by adding horizontal lines to it as if it had been shot off a TV screen. But the two artists seem to be in accord in wanting to convey the feeling that we don’t really understand what we’re seeing–something is amiss, and it’s up to us to put our finger on it. That’s why I continue to think that, his temporary alliance with Strauss aside, Demand is not attempting to confer a false normality on his country’s history. He’s availed himself, as Pousttchi has, of an image-maker’s right to let the image stand clear of the discourse around it, the discourse that goes into it and the discourse that comes out of it, and insist on its sibylline reticence. Read the catalog, and certainly read the title, but remember that they only take you so far. Berlin is like any other city, Germany is like any other country, but precisely because they are haunted houses. You know a revenant is near when you feel a chill.